It is with deep sadness that we announce the unexpected passing of Helen Walesiak. Predeceased by her husband of 49 1/2 years Edwin, her parents Anton and Bernice, siblings Johnny, Hillary, Joseph, as well as half siblings Mary, Tina, Pauline, Steve, Paul, Olga, Peter, Ann, Mike and 2 sisters in childhood. Helen will be deeply missed by her siblings, Audrey (Marcel), David, Norman (Joanne), Brian as well as sister and brothers-in-law Gladys, Arthur (Trudy), Erwin (Lucille), Lenard (Sharon), Arthur and many nieces and nephews. She also leaves behind a community of family and friends who will miss her warm smile and boisterous laugh. 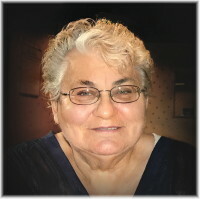 Helen was born in Thalberg, Manitoba and married Edwin in 1958. They farmed for many years in Brightstone before retiring to Lac du Bonnet and hosted many large family gatherings. Helen was an active member of the local Legion for many years, enjoyed community service, bingo, crocheting, playing cards, sharing recipes and spending time with family and friends. A Celebration of Life will be held on Tuesday, April 16, 2019 at 1:00 p.m. at the Legion Hall in Lac du Bonnet, Manitoba. Interment will be held at a later date. In lieu of flowers, a donation may be made to the charity or local organization of your choice. Shocked at Helen’s passing. Never know when God calls you home. My sympathy goes to her siblings. Helen is now at peace. We must let her fly with the Angels. Stachniak girls, Fran, Margie, Geraldine and Betty. Audrey, David, Norman, Brian as well as in laws Gladys, Arthur, Erwin and Leonard know that you are in our prayers. May remembering the special times bring some comfort in your grief.